Offering you a complete choice of products which include non woven felt, needle punched felt, non woven carpets, needle punch non woven carpet and non woven wadding. 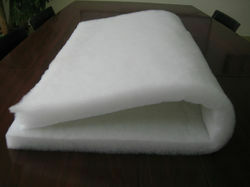 Needle punched nonwoven felt made from polyester fibres. Wide area of application in residential , commercial and industrial areas where heavy duty carpets are required. Our felt come in Fire retardant grades specially designed to provide cover to insulation material used in multiplexes, hotels, restaraunts, malls among other applications. They are used widely in multiplex cinema halls for superior Fire retardant and acoustic insulation properties. they can be applied by adhesive over walls with extremely soft finish available on the inner surface. We provide certifications such as UL94 , FMVSS 302 among many others.These nonwoven felt are rot, mold and bacteria free , they are immune to water and can be used for outdoor purposes as well.Most commonly available colours are grey , black , other colours are available on request.Application:· Geotextiles, Automotive, Filtration, Medical, Apparel, Papermaker’s felt, Marine, Industrial, Sports, Home furnishings.· Can also be used as agriculture textile, heat and sound insulation. Needle punched Felt made from polyester fibres. Wide area of application in residential , commercial and industrial areas where heavy duty carpets are required. Our felt come in Fire retardant grades specially designed to provide cover to insulation material used in multiplexes, hotels, restaraunts, malls among other applications. They are used widely in multiplex cinema halls for superior Fire retardant and acoustic insulation properties. they can be applied by adhesive over walls with extremely soft finish available on the inner surface. We provide certifications such as UL94 , FMVSS 302 among many others.These felts are rot, mold and bacteria free , they are immune to water and can be used for outdoor purposese as well.Most commonly available colours are grey , black , other colours are available on request.Application:· Geotextiles, Automotive, Filtration, Medical, Apparel, Papermaker’s felt, Marine, Industrial, Sports, Home furnishings.· Can also be used as agriculture textile, heat and sound insulation. 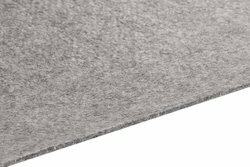 We offer nonwoven carpets fabricated from extra long fibres which provide the strength , tencaity , elongation and stretchability that is required to withstand continuous usage in residential , commercial and industrial area. They are also widely used in automotive applications as floor carpets for sitting space and boot areas. We are the only manufacturer from Eastern India making nonwoven carpets. Our carpets are an extremely competitive and better looking solution for areas which have very high footfalls like exhibitions , lobby areas , office spaces. 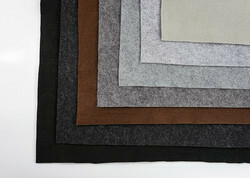 we offer various shades in grey , blue , red and camel colours. We can customise the carpets as per customer requirements , like offering a water and oil repellant finish , an anti-microbial surface , anti static surface. With these advanced finishes the carpet not only meets the longevity requirements it also provides a hygenic , clean and comfortable alternative to traditional substitutes. Our carpets are not attacked by rodents , insects , and are easily to clean using vaccum cleaners. Our range is available from less than 1mm thick to more than 5mm thickness and the width offered is upto 7 feet. 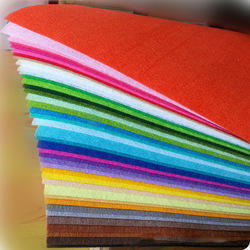 Needle punched nonwoven carpets made from polyester or polypropylene fibres. Wide area of application in residential , commercial and industrial areas where heavy duty carpets are required. Our carpets come in Fire retardant grades specially designed to provide cover to insulation material used in multiplexes, hotels, restaraunts, malls among other applications. They are used widely in multiplex cinema halls for superior Fire retardant and acoustic insulation properties. they can be applied by adhesive over walls with extremely soft finish available on the inner surface. We provide certifications such as UL94 , FMVSS 302 among many others.Times Fiberfill makes a specialised exhibition focused carpet which is an extremely cost effective and better looking substitute for other carpet solutions like dyed woven fabrics among others.These carpets are rot, mold and bacteria free , they are immune to water and can be used for outdoor purposese as well.Most commonly available colours are grey , black , other colours are available on request.Application:· Geotextiles, Automotive, Filtration, Medical, Apparel, Papermaker’s felt, Marine, Industrial, Sports, Home furnishings.· Can also be used as agriculture textile, heat and sound insulation. Looking for “Non Woven Carpets”?